Iraq with a $25 million bounty on his head, was killed when U.S. warplanes dropped 500-pound bombs on his isolated safehouse northeast of Baghdad, coalition officials said Thursday. His death was a long-sought victory in the war in Iraq. Al-Zarqawi and several aides, including spiritual adviser Sheik Abdul Rahman, were killed Wednesday evening in a remote area 30 miles from Baghdad in the volatile province of Diyala, just east of the provincial capital of Baqouba, officials said. 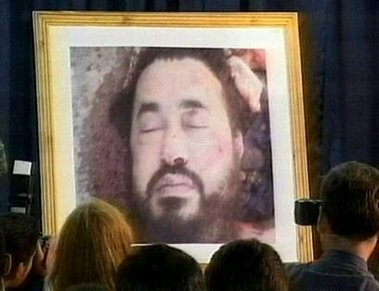 The U.S. military showed a picture of al-Zarqawi with his eyes closed and spots of blood behind him after he was killed by an air strike north of Baghdad. U.S. military spokesman Maj. Gen. William Caldwell displayed the photo during a news conference in Baghdad. Caldwell also showed a videotape of the attack in which he said F-16 fighter jets dropped two 500 pound bombs on the site. He said Iraqi police were first to arrive on the scene, followed by coalition forces. Al-Zarqawi's body was found and moved to a secure location, where it was positively identified at 3:30 a.m. Thursday, Caldwell said, adding that the confirmation was made with scars, tatoos and fingerprints known to be al-Zarqawi's. He also said a DNA analysis was being performed to be absolutely sure, but he expressed no doubt that the terror leader was in the house that was hit. He also said al-Zarqawi's spiritual adviser Abdul Rahman al-Iraqi was at the site. "We had absolutely no doubt whatsoever that Zarqawi was in the house," Caldwell said. (story has been expanded since I first linked to it) More here, here, here, here, here and here. 3) was there anything to the timing of this? Did Bush just need a bump or is there some bad news they are covering up, or distracting from (certainly the Haditha massacre springs to mind)?